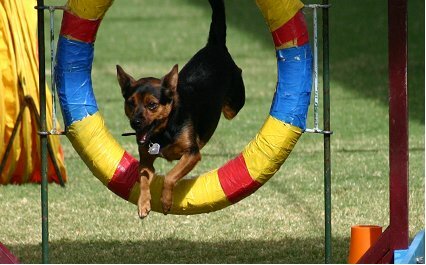 The Dogs NSW Agility Committee invites ANKC Affiliate Clubs to enter a Team in the Festival Club Challenge. This is a novelty team event in which your club members compete for the FCC Perpetual Trophy. This will be awarded to the winning club team for the club to display for the next 12 months until the next Festival of Agility. No qualifications certificates will be awarded in either class. ANKC affiliates can nominate one team only. Entry is to be made on the Club’s Letterhead. The Team Entry Fee will be as per the Journal advertisement for the Festival of Agility. The close of entry will be as per the Journal advertised date for the Festival of Agility. The names of the 5 team members and dogs (consisting of one dog from each height category; 200, 300, 400, 500 and 600) must be declared on the Entry Letterhead. A team member may handle more than one dog in the team. Team members must be members of the Affiliated Club and members of Dogs NSW, or other ANKC affiliated body, and may only represent one team. Any dog registered with Dogs NSW, or other ANKC affiliated body, may only represent one team. Affiliates unable to field a dog in any height category from their own club membership may borrow a dog owned by a non-club member, but it MUST be handled by a club member. Prior to the commencement of the first event of the competition dogs/team members may be substituted. No further substitutions will be allowed. The event is over one Agility and one Jumping Course. The courses are of an RQH design using the obstacles specified in these courses. under standard rules will be accumulated as they occur to to a maximum score of 200 penalty faults. occasion, before going back to the missed obstacle and re-attempting it. * Failure to complete the course for any reason will incur a score of 200 penalty faults. * The clear rounds and faults of all 5 team members for both events will be added together to give the team's Total Score. * The team with the lowest Total Score (ie - least total faults) will be the winner. * Where two or more teams have equal lowest scores the team with the least total COURSE faults will be declared the winner. * Where the total course faults are still equal the course time of each team member will be added together to give a total team time. The fastest team time will then be declared the winner.